What a Scream!!! 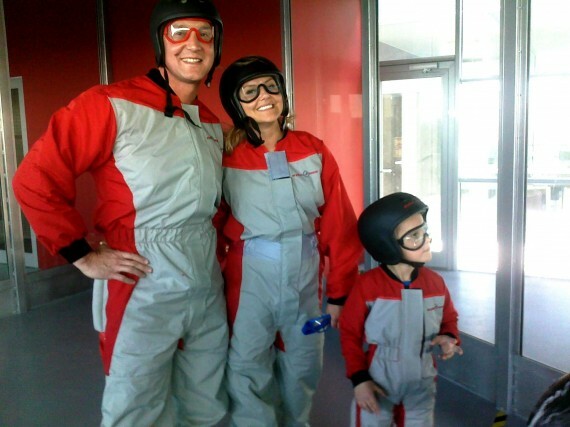 My whole family including Marcus (5) and Nicolas (4) went to try out the new Skydive Arena which offers you the possibility of flying in free-fall within the safety of a wind tunnel. Unbelievable fun and I was again amazed at how kids pick up on sports much faster than adults. This Arena must have been quite an investment. It is positioned right next to the Swimming Complex Laguna at Prague Letnany. 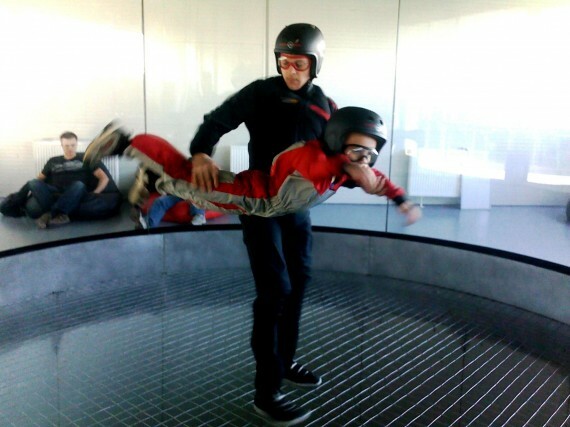 It is the only circular glass flight chamber in the world. It has a diameter of 4.3m and an overall height of an incredible 14m. You can feel what it’s like when the wind blows at a speed of over 270 km/h. I have to admit I was a bit anxious then I got in and found that it looks easier from the outside. 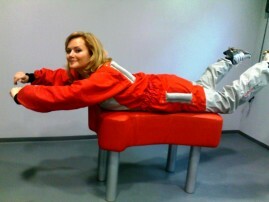 It is quite physical and you have to use lots of muscles to keep your position. 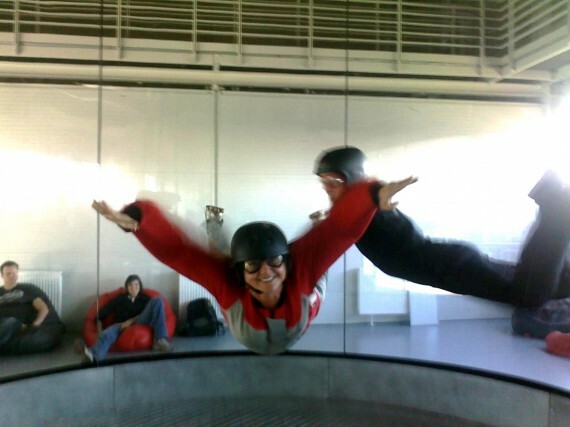 Don’t worry, its not like you’re going to crash miles to the ground, just jump into the tunnel and FLY! When we first arrived we were greeted at the reception and introduced to our Instructor Josh. There are in total 8 Instructors who speak both Czech and English. 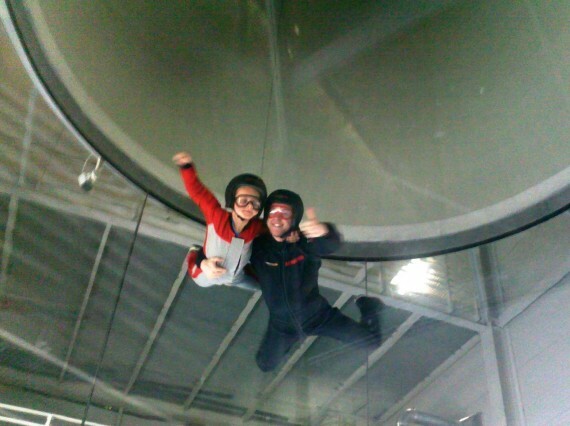 Josh came from UK, Milton Keynes where you can find another Air Tunnel. 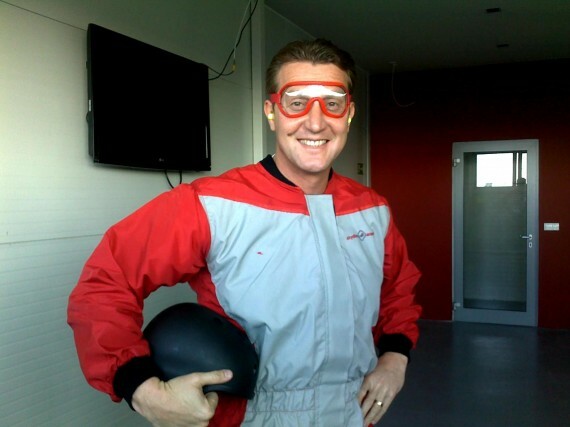 He gave us the suits and helmets together with goggles and then once dressed we walked into a special training room. You wear this special suit over your own clothes. I was wearing jeans and a t-shirt and I was comfy. Make sure you will bring some trainers with you. Any other shoes can just fly off your feet. The boys were thrilled just to be wearing their suits, feeling like Superman! In the training room Josh explained to us what to expect, how to move or it’s probably better to say How Not To Move! He taught us basic sign language so he could tell us what to do once we were inside the tunnel. It’s noisy in there so everybody uses ear-plugs. To keep your position and do a bit of flying your Instructor shows you with sign language how to bend your legs or straighten then, lift up your chin or move your hips. 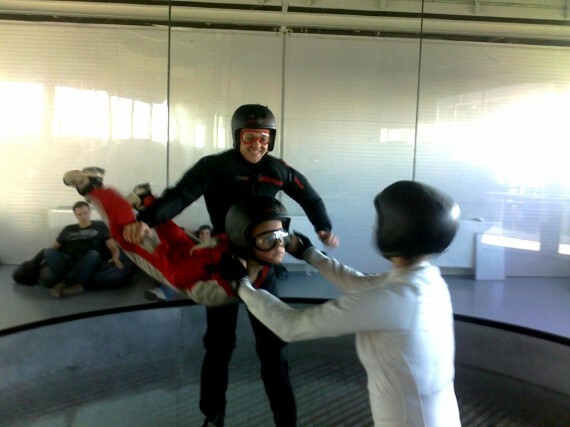 All the time the Instructor is inside the tunnel with you and helps you to hold your balance, they take you all the way up and down and make sure you will not drop like a stone to the bottom or do something out of the ordinary. They say it’s like a good work out and yes – I felt some muscles I didn’t know existed when inside the tunnel. The length of my flight was 3 minutes and I was not tired afterwards. Then my Nikki (4) went inside, he struggled, got scared and had to come out. I think he wasn’t ready for the speed of the air and the noise inside the tunnel. That should have been better explained to him. Of course we did not force him to go back, but imagine you pay for your child 1500czk for 3 minutes and its not succesful… I think they should compensate with at least 50% money back. My Marcus however had the time of his life, flying up and down doing a magnificent job with holding his body in the right position and staying cool. His cousins still ask their Mom how is it possible that Marcus flew like an Iron Man. He went inside twice and would love to go back. I was lost for words at the end when Josh (The Instructor) stayed inside the tunnel on his own and showed us some of his tricks. I was gobsmacked. 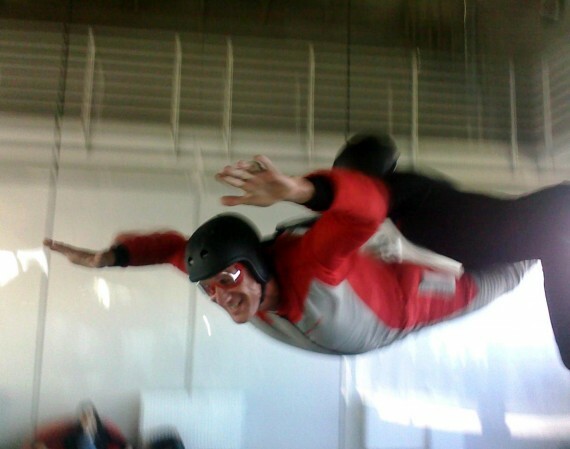 He was flying with his head upside down, running with his feet around the tunnel, making his way quickly up and down like it was the most natural thing he had ever done. 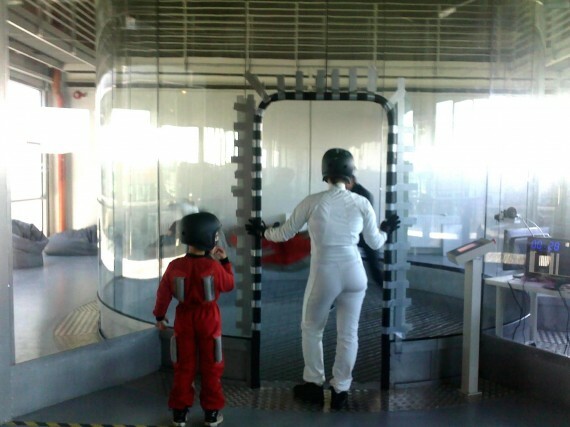 If you want to get a taste of this incredible activity, you can visit the restaurant that has a glass wall so you can observe what it happening in the wind tunnel. I suggest you make sure someone will be in first. You can call +420 734 676 016 and ask about their schedule. The restaurant set up is perfect for a company party or client treat. You not only observe the flying people through the glass wall but can also view them on the Plasma TVs around the restaurant. 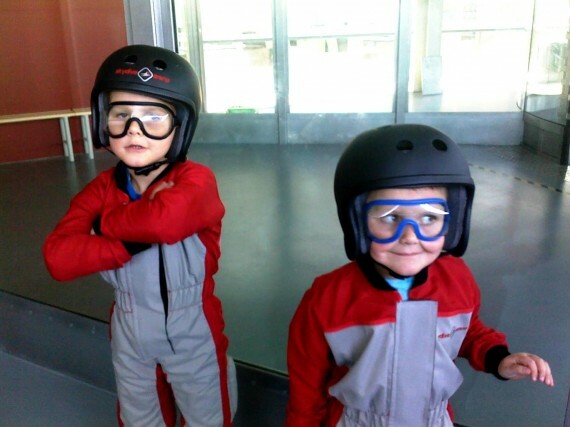 The plan is to open a Kids Club, where kids will come in a group to do Air Flying as a hobby on a regular basis. I like the idea very much because I am sure Marcus would love it. Lets see what prices they will come up with. So far they are high. They also plan do do some special offers for Kindergartens so we’ll see. I forgot to mention, at the end of your flight you will receive a movie of you in the tunnel. Trust me – you will have a great laugh!! !